It is the first Monday of the school summer holidays and I have taken the day off work. 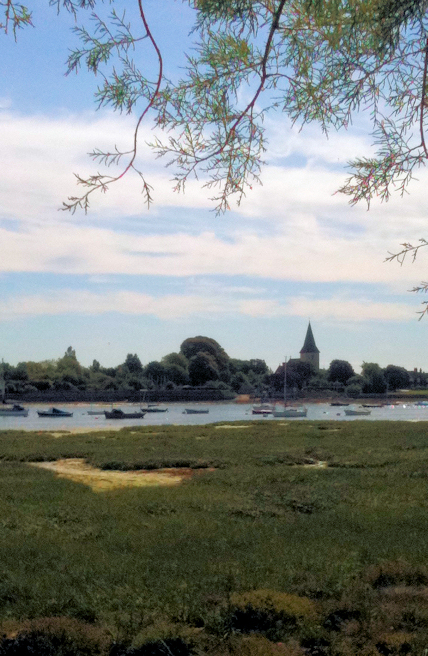 Today I am walking round a peninsula that protrudes down into Chichester Harbour, between Bosham and Thorney Island. On the map, this finger of land looks sparsely populated with one village called Chidham on its knuckle and a few houses clustered near the its tip. My camera is broken, following the drop onto the hard floor of the pub yesterday. I am reduced to taking photos with my iPhone. I am not in the best of moods. I start off along a path that runs below the sea wall, on the landward side, walking through farmland. Then, up on the sea wall itself, I walk along a narrow path. 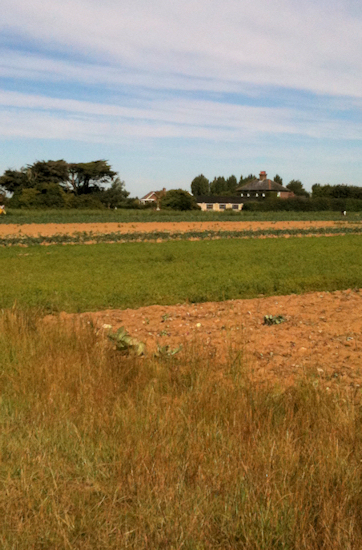 After a while, I am forced off the path by a housing estate on the outskirts of the village of Chidham. The houses are large. The gardens well-tended. Stern signs tell me to stick to the roadway through this area – walkers are only just tolerated and we must behave ourselves. 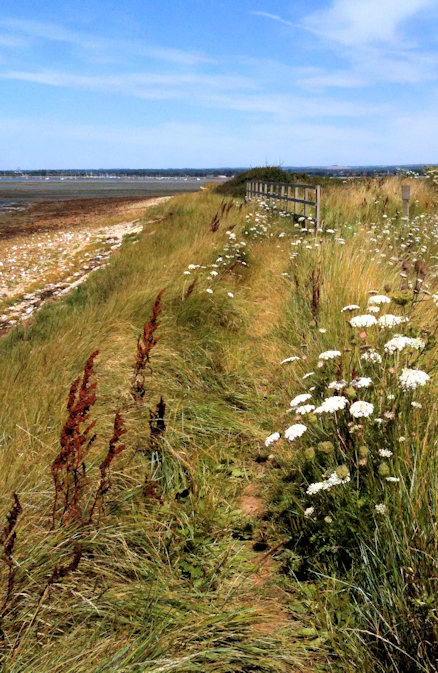 Finding a footpath to the sea wall again, I am relieved to be back on the coast. 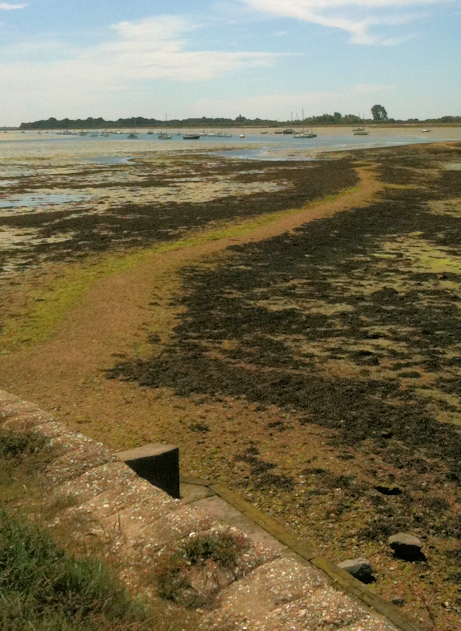 The tide is out and to my left I look across flat marsh and mud to Bosham, where I walked yesterday. Further along and I am forced off the coast again. This time, by a private marina. I wander around a track that leads behind the boat yard and around some buildings. Between gaps in fencing, I notice a group of youngsters gathered around an instructor. I believe this is Cobnor Activities Centre. Momentarily I become lost. I ask some people where the footpath is, but they are visitors to the Centre and they don’t know. Then I see a man with a rucksack, walking purposefully, and I follow him. At the far end of the Centre, I am allowed back on the sea wall again. 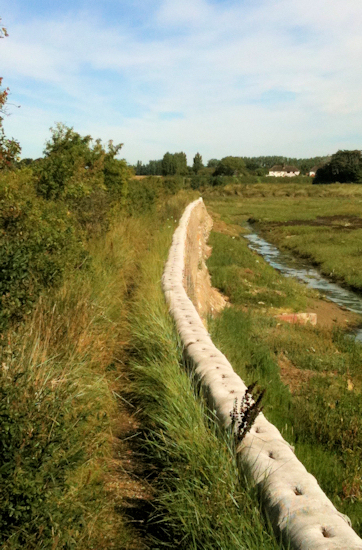 This area is a nature reserve and some effort has been put into making pools of water just inland of the shore – The Cobnor Point Habitat Creation Scheme – particularly designed to encourage water voles. I watch out for these little creatures, but I don’t see any. This part of the walk has been designed to allow wheelchair access. I meet a few other walkers, but non in a wheelchair. Across the mud and the water, I can see West Itchenor and the narrow channel of water across which I rode in the Ferry P yesterday. 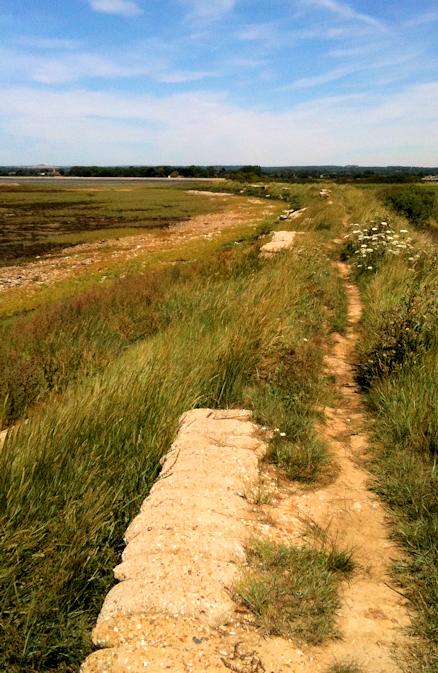 After a while, as I round Cobnor Point, the path narrows again and I walk on the shore itself, just below the sea wall. It looks as if this path is just above the high tide mark but may become flooded at times. Overhanging the sea wall are oak trees. They are very close to the shore and I walk on the shore beneath their overhanging branches. I wonder how they survive. Are their roots bathed in salt water when the tide comes in? At this point I pass a couple of walkers, husband and wife I presume, walking towards me. They have walking sticks and look tired, picking their way over the stones along the shore path. I suspect they are walking round the whole of this peninsular, as I am, but in the opposite direction. From here on, I see nobody else until I get closer to Prinsted. Back up on the sea wall now and this part of the walk is very pretty. There are wild flowers along the path. To my right, inland, I see glimpses of the private grounds of a fine house. This gives way to waterways with fields beyond. The country side is empty of people and very tranquil. I follow the sea wall. The sun is shining. There is very little breeze. It is growing hot and I am hungry for lunch. There is no vehicle access to this side of the peninsula and I have no choice but to continue walking until I reach the ‘mainland’ again. I walk around Chidham Point. Nearly there now. At the top of the peninsula, just south of Nutbourne, I begin to see walkers – people out with their dogs and children. A few families are sitting on the shore, on the edge of the mud, picnicking. The adults sit sunbathing on the stones of the sea wall, while the children grub around in the wet marshland. In the distance I see a marina with sailing boats moored in the channel of water and I realise I am looking at Thorney Island. A spit of mud, looking like a causeway, leads out towards the water. For a moment I am tempted to walk along it. Surely I can cross over here? But a look at my map dissuades me. There is no way across the mud. Eventually, I arrive at a car park. This is Prinsted, part of Southbourne. It is time for a late lunch. My husband and I drive to Rowlands Castle, where we sit outside at a pub and eat a good meal in the sunshine. We savour a rare Monday morning off work together. Next to us, a table of teachers, with a whole six weeks of holiday ahead of them, sit and moan about how hard they work. Am I sympathetic? No! Horizontal distance travelled = 2 miles. 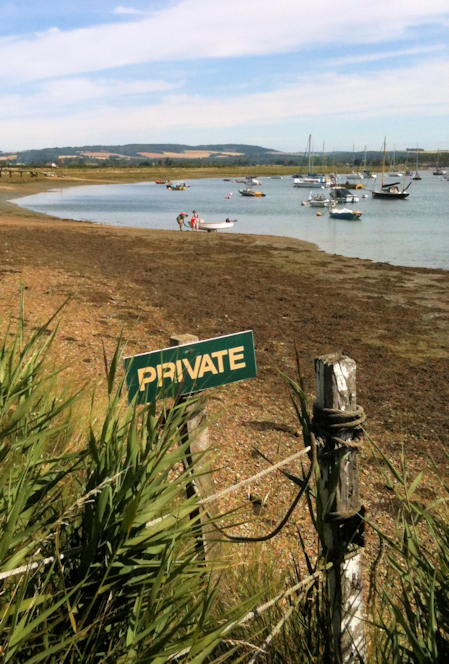 This entry was posted in 06 Sussex and tagged coast, footpath, hiking, Sussex, walking. Bookmark the permalink. Just to say I have been finding your blog fascinating. I had been planning to do a similar walk for some time, but I am now inspired to start in the next couple of weeks. I hadn’t thought of writing a blog (being somewhat IT-challenged), but I will now try and do so. It has been really interesting to read the other blogs you have linked to, each walking round the coast in their own distinctive style. Looking forward to joining this small bur growing club! Hi Phil and I am thrilled that you found my blog inspiring enough to start your own coastal walk! 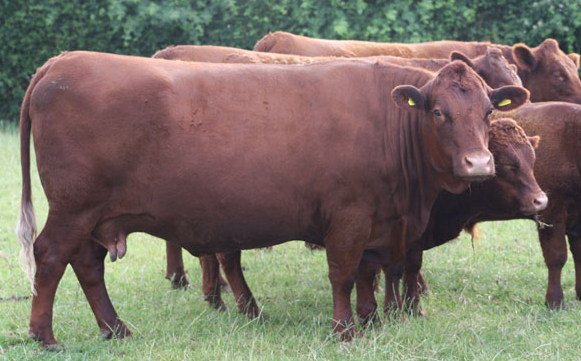 Best of luck with your venture and, once you have got going, let me know and I will add you to my blog roll. Don’t forget to visit David Cotton’s excellent site if you need practical details of routes.